Seriously, we’ve been in a Dragon Ball Z state of mind lately! 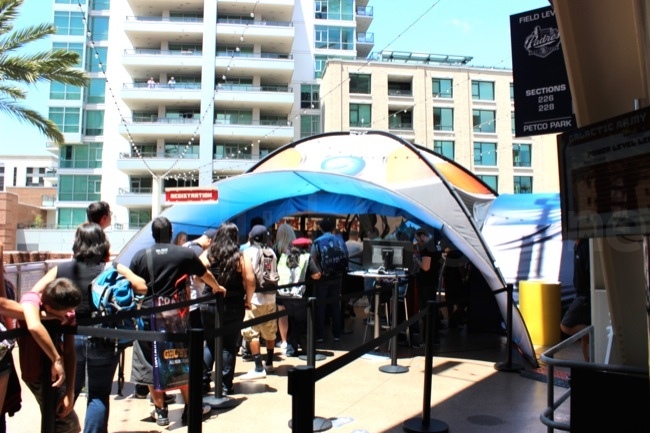 With the Dragon Ball Z: Resurrection of “F” hitting US theaters this August, we couldn’t resist swinging by Petco Park during San Diego Comic Con and checking out what Frieza’s Galactic Army Boot Camp was all about. 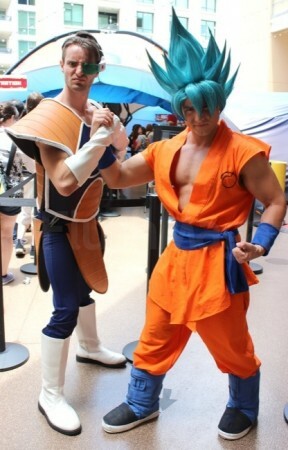 Apparently, the folks over at FUNimation created various interactive terminals where Comic Con goers could test their skills of Energy, Agility and Strength to see if they were worthy to join Frieza in his epic battle against Goku to destroy earth. I’m pretty certain that everyone was just hoping that their power levels would be over 9000. After waiting in line, everyone had three interactive booths to navigate through. Each tested their skills of Energy, Agility and Strength and as they completed one test, they added their scores to the scorecard. Both of the Energy and Agility tests used a motion controller to test their ability. First up was the Energy Test. Everyone at the Energy Test Station used their hands to control a floating orb on the screen then shoot through various obstacles while avoiding dangerous red obstacles. For your scorecard, you were able to record the best out of three attempts at all the stations. This was pretty lenient since using the motion controllers took a little bit to get used to. After that, it was on to the Agility Test. Similar to the Energy Test Station, the Agility Station featured another motion controller but had everyone control a ball. Using your hand, you had to control a rolling ball while avoiding pitfalls and other random obstacles that wanted to get your ball off the track. Once you got your top score on that, it was on to the final station: Strength. The Strength station was pretty self-explanatory: hit the punching bag as hard as you can. Now that we’ve got our scores, it’s time to check out the leaderboard! Shocker, our scores we not on the top of the leaderboard but at least they were over 9000. Phew! Now with San Diego Comic Con behind us, it’s time to countdown to the limited theatrical release of Dragon Ball Z: Resurrection ‘F’! If you’re interested in purchasing tickets, check out the movie official website which has the listing of all the participating theaters.